Excerpts, a solo exhibition of drawings by Washington, DC-based artist Molly Springfield. 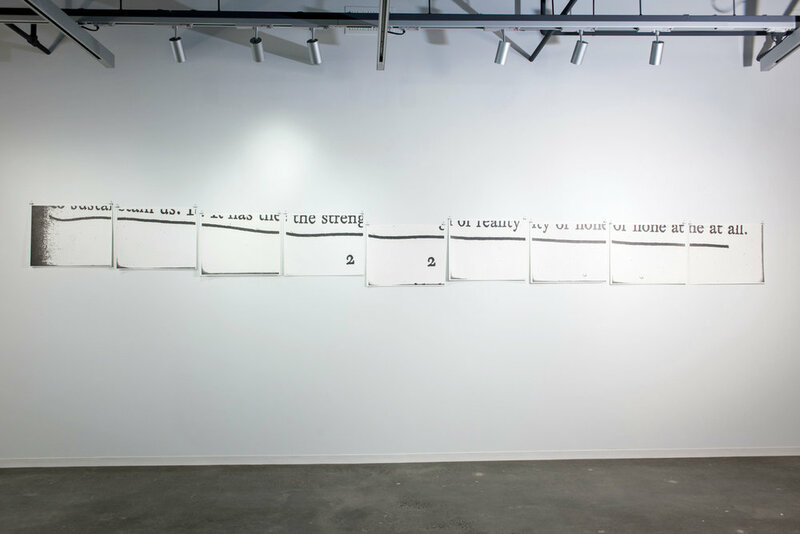 Springfield is known for her meticulously rendered graphite drawings of photocopies of printed books, and often makes work that considers the changing nature of reading in an era of digital transformation. The source material for the drawings in Excerpts comes from Springfield’s ongoing project The Marginalia Archive—a functioning archive of contemporary examples of marginalia (readers' written annotations of texts), which the artist has been soliciting and collecting since 2007. The archive, some of which will be included in the exhibition, includes a large selection of found marginalia from books in Washington, DC’s public library. Made by anonymous library patrons, the who, when, and why of the underlining and commentary remains a mystery, but their marginalia is evidence of their engagement with and relationship to an author’s work. Springfield takes that evidence and uses it as source material for large-scale, multi-panel graphite drawings. Through the process of photocopying and re-photocopying, she enlarges text and image. The added visual noise and texture created during the photocopying process adds an additional layer of annotation (marginalia on the marginalia) but also underscores the endurance and breakdown of the materiality of language in contemporary digital culture.